Make Timberly Motel your home away from home. 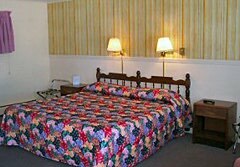 Our 30 clean comfortable rooms offer King & queen size beds * Color Cable TV with HBO * Full bathrooms with tub showers * Air conditioning * Individually controlled electric heat * Direct dial phones * Fax service available * Private outside entrances * Smoking and non-smoking rooms * Free continental breakfast * Guest rooms, suites & (2) two bedroom units . We are also AAA approved. Snowmobilers can ride directly to the trails from the Timberly Motel.